American artist Zoe Leonard is renowned for photographs and sculptures that explore how images are created, displayed and viewed. Based in New York, she has frequently captured the city’s changing urban landscape, as well as engaging with political activism and shifting notions of identity. 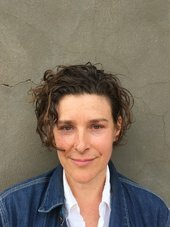 This is a unique opportunity to hear Leonard discuss her practice, in conversation with curator and art historian Briony Fer. The talk will be followed by a private view of Leonard’s Sun Photographs series, currently on display at Tate Modern. Zoe Leonard (born 1961) lives in New York City. An artist who works primarily with photography and sculpture, Leonard has exhibited extensively since the late 1980s, including solo exhibitions at the Whitney Museum of American Art, New York (2018); Museum of Modern Art, New York (2015); Chinati Foundation, Marfa, Texas (2013-14); Camden Arts Centre, London (2012); Museum Moderner Kunst Stifting Ludwig, Vienna (2009); Pinakothek der Moderne, Munich (2009); Reina Sofia, Madrid (2008); Dia: Beacon (2008); The Wexner Center for the Arts, Columbus, Ohio (2007); Fotomuseum Wintherthur (2007); Philadelphia Museum of Art (1998); Kunsthalle Basel (1997); Secession, Vienna (1997); and The Renaissance Society, Chicago (1993). Group exhibitions include Documenta IX (1992), Documenta XII (2007), and Whitney Biennials in 1993, 1997 and 2014. Publications include Analogue (2007), Zoe Leonard: Photographs (2008), You see I am here after all (2010), Available Light (2014), and Survey (2018). Briony Fer is an art historian who has written extensively on modern and contemporary art. Her research interests have consistently moved between the history of the avant-gardes and the work of contemporary artists, including Gabriel Orozco, Roni Horn, David Batchelor and Tacita Dean. Her books include On Abstract Art (1997), The Infinite Line (2004), Eva Hesse: Studiowork (2009) and Gabriel Orozco: thinking in circles (Fruitmarket Gallery, Edinburgh, 2013). She is Professor of History of Art at University College London and a Fellow of the British Academy.